Neither the Warriors nor the Raiders started the 2018 NRL season as might have been expected. On the one hand, Canberra have lost their first two matches by two points, while New Zealand had racked up two successive wins – wins over the Titans and the Bunnies, to be fair, but wins nonetheless. Heading into GIO Stadium on Saturday afternoon, then, Canberra were looking to break a pattern and the Warriors were looking to make a pattern, in one of those matches that has the potential to set the shape of the first part of the season for both teams involved. The stakes were especially high for the Raiders, and that showed in the first five minutes, in what has to be one of the most high octane opening of the NRL season so far. Four minutes in, the Warriors had conceded four straight penalties, leading to a period of mounting pressure from Canberra and some huge hit-ups right on the line, with Iosia Soliola, in particular, showing his mettle early on with a pair of massive tackles before and after the Raiders chose to tap after the first penalty. If the Raiders’ attack was epic, though, the Warriors’ defence was almost as impressive, with Roger Tuivasa-Sheck putting in an extraordinary trysaving tackle in the midst of the second set to prevent Aidan Sezer getting to ground. Storming in from about ten metres out, the Canberra five-eighth looked certain to score, only for RTS to come up from beneath him and then contain him half a metre over the line, in one of RTS’ most stunning moments for New Zealand in the last twelve months. Still, the defence took its toll penalty-wise, and with the Warriors giving away the fifth the referee the team a formal warning. 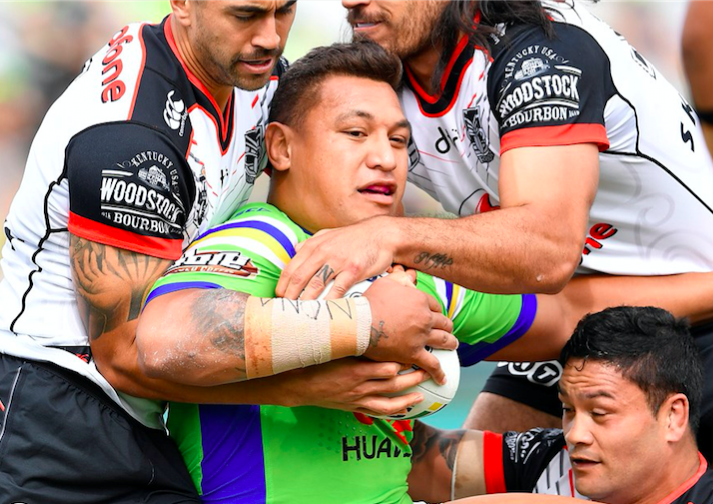 Following on from a goal line dropout that gifted the Raiders yet another set of six, Issac Luke made high contact, only for the ref to give him the benefit of the doubt – plus another penalty – for what looked like an accidental move. No such luck for a late shoulder charge from Adam Blair a couple of tackles later, though, as the ex-Bronco was sent to the bin for ten minutes. Up until this point, the Warriors had taken their cues from RTS’ magnificent trysaving tackle, with a squad of New Zealand jerseys managing to hold up Joey Leilua at the end of a similarly damaging run. If the visitors had managed to prevent Canberra scoring, it would have been as good as scoring a try themselves, but with a twelve man team, and on the back of six restarted sets, it was too much to ask, and Siliva Havilii managed to crash over a minute later, with RTS unable to save it this time. All that Canberra momentum seemed too much to result in a single try – especially with a Warrior off the field – so it seemed only natural when they crashed over once again a minute later, at the end of a kinetic, high-octane sequence that played like a continuation of their opening bout of possession. It started with a rapid play-the-ball from Soliola followed by a brilliant run from Leilua, who smashed through three of four Warriors like they were skittles before sending the Steeden across to Croker. From there, Croker continued the run, and initially looked set to offload, only to realise that taking the tackle was the best option at this point, and that the green machine would be able to rapidly recoup Leilua’s momentum with a rapid enough play-the-ball. They did, too, with the Steeden now shifting hands rapidly before it made its way over to the right side of the stadium, where a one-handed offload from Soliola set up Luke Bateman to cross over. Full credit to the big lock, but this try also felt like a testament to Soliola’s combination of backline dexterity and forward pack strength, and the culmination of what had been a stellar opening bout from him. Yet if the Raiders were monsters in attack, they were considerably less convincing in defence, letting the Warriors through – and with a twelve man squad at that – on the first occasion that New Zealand really had a chance at their line. Indeed, Canberra looked like a totally different team from the one that dominated the opening moments as Shaun Johnson, Blake Green and RTS executed such a professional string of passes – running up to the line, forcing the Canberra players to commit – that Peta Hiku didn’t even have to get the ball over to the wing in turn, simply dummying and then slicing through the defence to put down four points. After such an epic start from the Raiders, the simplicity and professionalism of this first Warriors’ try was a bit of a blow, with Nick Cotric spinning around to contain the Steeden on the wing before realising that Hiku had already got it to ground behind him. Booting through a fairly challenging conversion, Johnson brought his team back within six points of the hosts, but in many ways the Warriors felt psychologically ahead at this point, given everything that Canberra had brought to the table so far. New Zealand consolidated their newfound momentum further in the minutes before half time, when RTS smashed over the line and initially seemed destined to put down points much as Sezer had in the opening minutes of the game. While the Raiders held up RTS much as RTS had held up Sezer, Roger the Dodger still managed to pop a one-armed offload back to Luke, with the Steeden then moving through several pairs of hands before the frantic Canberra pack defence could clean it up. In other words, as good as the Warriors were, the Raiders also brought their defensive game for the first time of the afternoon as well – and the spectacle of a solid Canberra defence must have been as satisfying a closing spectacle to Ricky Stuart as the prospect of four or six more points. As it was, though, that massive effort on their own line propelled them even more rapidly back towards the Warriors’ end in the minute that remained after they regained possession, as they recovered and compressed the high-octane momentum of the opening minutes. So compressed was it that this final stretch felt a bit like the end of the game, rather than the end of the first half – the sense of urgency was immense – which is perhaps why Sam Williams chose to slot through a field goal with thirty seconds on the clock. It was a classy, if unconventional, way for the Raiders to head into the sheds, and only compounded by two penalties from the Warriors in quick succession when they returned to the field – the first from Ken Maumalo for tackling Jordan Rapana under the high ball in the air, the second on Jazz Tevana for a nasty leg pull in the ruck. If that wasn’t enough, the penalty-laden set came off the back of one of the deftest and most dexterous moments for the Raiders in the game – Rapana’s beautiful collection of the high ball, rivalled only by RTS’ catch that took him to the ground slightly earlier. With that confidence behind them, the Raiders now proceeded to put in the best try of the afternoon so far – a try that gathered all the barnstorming, short-range slams at the line that had been such a hallmark of the game into a display of almost superhuman strength from Cotric in the left corner of the field. In some ways, this was also the simplest try of the night as well, with the big winger simply slamming through Johnson, Hiku, Harris and RTS to slam the ball to ground beneath a mass of Warriors jerseys. At first the on-field ruling of try seemed contentious at best, but in slow motion it became clear just how elegantly Cotric had maintained possession of the Steeden, keeping his right elbow above the turf at all times to avoid a double movement, and getting the footy onto the chalk – or so it seemed from the angle – despite the entire Warriors side collapsing onto his back. With that kind of damaging display from the Canberra winger – his first try of the year – it was critical that New Zealand come back, and come back quickly, in order to regain some control of the game. As it turned out, however, the Raiders were the next to put down points with a penalty goal, while Junior Paulo slammed over beneath the posts a couple of minutes later. Sure, it might have been denied due to obstruction, but as yet another example of just how hard and fast Canberra could surge at the line, it must have been a dispiriting image for a flailing Warriors oufit. It was all the more rousing, then, when Tohu Harris managed to cross over shortly after, in yet another barnstorming, short-range effort – this time off the back off an offload from Ligia Sao to Johnson during what initially seemed to be a trysaving tackle from Leilua. We were back to a seven point game, and yet New Zealand found it harder and harder to glimpse another try, as the green machine – despite a few errors of their own – doubled down on their game as the final siren drew near. The nadir for New Zealand came about seven minutes out from the end, in a passage of play bookended by a mistimed kick from Johnson (and a seven tackle set for the Raiders) and then a forward pass from Johnson once the Warriors made it back down their end of the field. Between those two poles, a terrific offload from Fusitua to RTS initially appeared to have put the New Zealand fullback into open space, only for Soliola to launch up from behind, launch onto his waist, and get him to ground. Less a trysaving tackle than a gamesaving tackle, it was the perfect conclusion to one of the best games in Soliola’s career at the Raiders – a game in which he managed to blend the big hit-ups required of a prop and the dexterity and speed required of a backliner as never before. No player on the field – not even Sezer or Croker – quite personified the Raiders across the course of the game, in both strength and vision. With three minutes left in the game, and a penalty right on the Raiders’ line, the Warriors were faced with a conundrum – given that they had to score twice to get ahead of the seven-point lead, did they take the two now or tap and go? They chose the latter, and it paid immediate dividends, as Luke dummied and sliced through the Canberra defence to put down the softest try of the afternoon so far, bringing us to a one-point ball game and making Williams’ field goal feel even better in retrospecr. While Johnson might have had a bit of an inconsistent night with the boot before this, he sailed it through the posts when it counted, slotting through a field goal one hundred seconds out from the end, as everything at stake for both teams – two wins for the Warriors, two losses for the Raiders – was drawn into almost unbearably suspenseful relief. Thirty seconds later, Johnson sent through another one-pointer, at the back of exactly the same set the Warriors had put in for the first field goal. After a game that had started with Canberra’s four best minutes of attacking football all year, and an afternoon that had seemed to favour the green machine for most of the eighty minutes, the Warriors had now won on the back of two successive field goals. 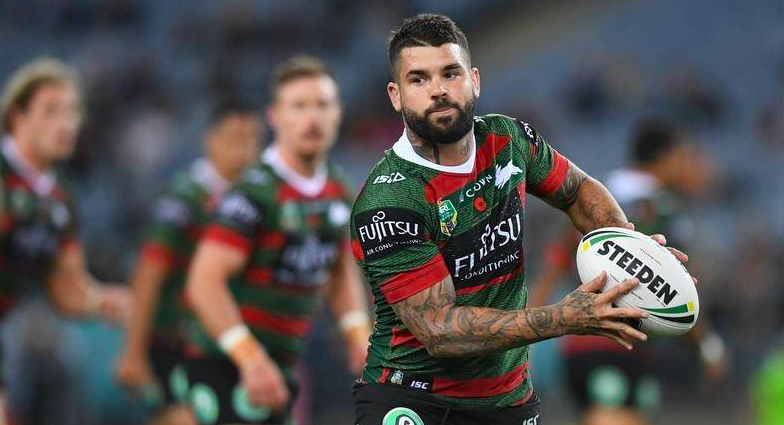 What’s more, they’d won their first three games of the season for the first time ever – a rousing and historic moment, and confirmation that their renewed form against the Bunnies and Titans was no coincidence. Perhaps, finally, this will be their year, and perhaps it will still be the Raiders’ year as well, although in the short term they need a win desperately to make up for such a dispiriting trio of games.